The Christchurch Golf Club has a history stretching back to 1873 and according to our records this makes Christchurch the second oldest golf club in New Zealand. Today’s course is located in the garden suburb of Shirley but once up a time, like many old established golf clubs, life began on another site at Hagley Park, near the city centre. Nine holes were ready for play at the new Shirley site in 1900, and the course was extended to 18 holes by 1910. It was 1972 when more land was brought into play, and the course took on the routing that essentially remains today, after work by Sloan Morpeth. In the 1990s, the course was refurbished by Peter Thomson and Mike Wolveridge, who instigated a program of tree removal that gives the current layout its more strategic design. The course lies either side of Lake Terrace Road. Holes 5 to 11 are on a flatter, more open section north of the road, whilst the rest of the course occupies more tumbling ground, the holes weaving their way in-between mature copses. Unlike many New Zealand club courses, there are features more akin to traditional Northern Hemisphere parkland courses. Many greens have defined tiers, swales or false fronts, and traps are much deeper than those seen on more modern tracks. Christchurch Golf Club has played host to numerous championships, including hosting the New Zealand Open on no less than eleven separate occasions. However, the club is proud and honoured to have played host to the 1990 World Amateur Championship. The famous Eisenhower Trophy was won by the Swedish team with the New Zealand team achieving a creditable 2nd place, tied with the U.S. squad. New Zealand’s most famous golfer, Bob Charles, has strong links with the club. He joined the club as a twenty-year-old, and it was from here he launched his career as a professional golfer. He is now the club’s patron. 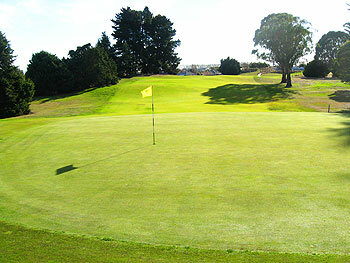 Christchurch Golf Club dates back to 1873, making it the second oldest club in New Zealand. The club started at a site at Hagley Park, but moved to the current site in 1900. In 1972 Sloan Morpeth made changes, improving the routing of the course and then in the 1990's Thomson & Wolveridge removed trees to give the course a much more open 'playing fields' look. More recently Brett Thomson is the local consultant overseeing the recovery from the earthquake damage, and course improvement. Christchurch GC is regarded by many as the premier course in the area, and has hosted the NZ Open 11 times, as well as the 1990 World Amateur Championship. Christchurch GC is a quality establishment with an impressive modern clubhouse, and a manicured and strategic course which will test any golfer's mettle. It is a must play if you visit the area. I played "Shirley", as it's known locally, before the earthquake and had a tremendous day at a friendly course, certainly more enjoyable than some of the more modern courses nearby. One note of caution, try to ensure your tee time doesn't coincide with large parties of visitors which can lead to a slow game. The pro shop helped me with this, but as the incredible range of branded products in the pro shop showed it's a very popular course for visitors. I think the most important point to make to an international visitor about the Shirley course is that there’s no sign of the earthquake damage it suffered last year (substantial liquefaction), unless you really know where to look (I didn’t, and I didn’t spot anything). The clubhouse – well, it took quite a hit, and may need to be demolished, but the course is totally fine. The most important thing from a design perspective is that it clearly bucks the trend in terms of the way the majority of Kiwi parkland club courses are set up, and it is entirely refreshing. Those ubiquitous lines of trees are not there; the course clearly illustrates that you only need a few mature trees to influence the playing line, whilst allowing potential for heroic recoveries. Bunkers are thoughtfully placed, and usually have deep faces (in other words, they are proper hazards). Greens complexes (in the main) have ‘old school’ lines – tiers, ridges, false fronts – that make think about your strategy even from the tee. All considered, given that the property could not be described as spectacular golfing land, it leaves the impression that the design is close to squeezing full potential from what it had to work with. I think it should be held up as an example for other Kiwi parkland clubs to aspire to when considering course improvements. I think it’s best to summarise as a tale of two halves (roughly), with the holes south of the road being far superior to those on the north side. The first four holes had me really excited that I’d found a track of low-key genius. Imposing fairway traps, inspired green complexes, great variation from the off. The 3rd green particularly captured the imagination – a huge and bold swale front-left opposite two greenside traps front-right meaning that this short par 3 needs pinpoint accuracy or a hell of a difficult recovery. And this all springing from fairly featureless land – it could have been such a ‘nothing’ hole, but instead it’s exquisite. Unfortunately, once you cross the road, the routing of the next six holes just sees you wandering up and back along fairly level ground. Whilst there’s some decent hazard placement that elevate some of the holes out of the mire of mediocrity (fairway bunkers on 5, a centre-line bunker off the tee on 6, and a neat 9th green), the rest of this section falls a little flat. There’s a stream, but it’s not really used that well in my opinion. Then it’s back across the road, and it’s pretty strong all the way home from there. The 14th is particularly good– the humped fairway invites a decision – stay high for a better trajectory into the green, or try and gain extra distance, but leave a steep uphill approach.